Spread around the Napa Valley are a number of very interesting and appealing landmarks and significant buildings from the past. The Bale Grist Mill is one such historical monument and this important local landmark was constructed in 1846 by Dr. Edward Turner Bale, an English surgeon, immediately playing an integral part in Napa Valley's milling process by turning huge quantities of wheat its ground flour. 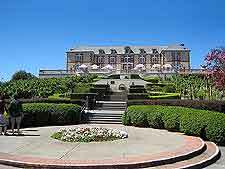 Very much worth a visit and widely regarded to be amongst the most outstanding historic chateaux in the whole of North America, the Domaine Carneros is an especially grand mansion, with formal planting, surrounding vineyards and a palatial facade. 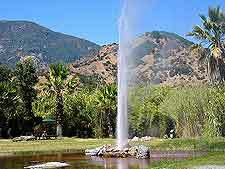 Another Napa Valley landmark, although one with a difference, is the Old Faithful Geyser of California, which is to be found in the city of Calistoga and at regular intervals, shoots water to heights of more than 18 meters / 60 feet. 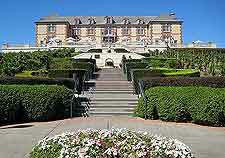 The Domaine Carneros appears as if royalty should live here and has become one of the most instantly recognizable landmarks in the Napa Valley, enjoying an elevated setting and almost endless views. Guided tours of the chateau area available, as is accommodation and an acclaimed restaurant, where gourmet food is always accompanied by one of the Domaine Carneros' very own Pinot Noirs, Chardonnays or white sparkling wines. Using diverted water from the Mill Creek, the first 6-meter / 20-foot wooden waterwheel at the Bale Grist Mill was soon enlarged to 11-meter / 36-foot, when it became one of America's biggest water wheels of its kind remaining an important valley landmark today. Look out for the regular summer milling demonstrations, which provide an insight into the noise and hard work involved with a working mill. 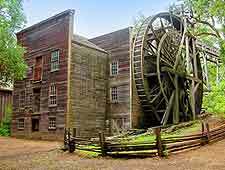 The Bale Grist Mill also features beautiful surrounding parkland, filled with mature trees. Whilst most people hearing of the 'Old Faithful Geyser' will immediately think of the Yellowstone National Park, the actual term 'Old Faithful' simply denotes any geyser that regularly erupts. Napa Valley's Old Faithful Geyser is located in Calistoga and is especially impressive, spurting steaming water high into the sky. Don't overlook this local landmark, and as the geyser erupts every 30 minutes or so without fail, you won't have long to wait until you see some action. The onsite seismic and geothermal exhibition provides added interest. The historical Old Town area of Napa was laid out in the late 1840s and is filled with interesting architecture, magnificent buildings and a characterful marketplace, much of which back to the 19th century. 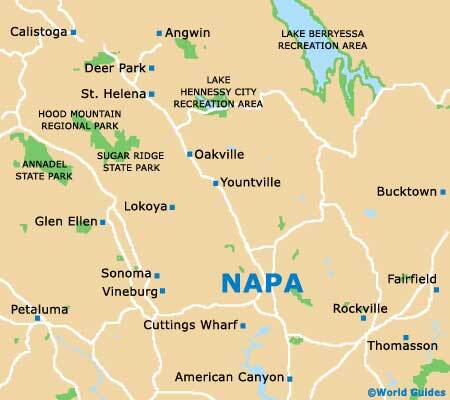 In the 1950s, the gold and silver rush brought great prosperity to the city of Napa, with the Silverado Mine on Mount St. Helena being a particularly productive spot, and at this time, many grand houses and landmarks were built. There are plenty of antiques shops and boutiques scattered all around the Old Town district, along with pavement cafes, casual dining, riverfront views and nearby wineries. The Old Town really does provide a taste of the past.